As I write this article, I’m munching on kippers. I paid a buck for a tin of them. For food enthusiasts like myself, it’s a no-brainer to shop for gourmet goodies at choice food markets like Caputo’s, Liberty Heights Fresh, Pirate O’s and so on. But, here’s a confession: I also haunt stores such as Dollar Tree (multiple locations, DollarTree.com) and Big Lots (multiple locations, BigLots.com) when I’m looking to stock my pantry. That’s because while I’m not cheap, I am frugal. And you might be surprised by the eclectic array of foodstuffs from around the globe that are stocked at your local liquidation store. Stores like Big Lots and Dollar Tree have a dizzying range of food items. Most are products purchased in large volume from manufacturers—sometimes they are test-market items, sometimes they are items with packaging/marketing changes or discontinued products. And, sometimes, the products are getting close to their “sell by” expiration date, although most of the items I recently bought don’t expire until late 2013 or early 2014. This means that you’ll often see items one month that are gone the next; inventory is inconsistent. Yet, that’s part of the fun of shopping at these discount stores; it’s like foraging for hidden treasures, and you never know what you might encounter. One thing is certain though: You’ll always find exotic goods, the sorts of things you probably never imagined finding in any place other than a high-end grocery. What you won’t find at these stores is fresh food. There is no produce, bread, fresh meat, seafood and such. Some stores do sell frozen food items, but mostly this is about dry goods—the stuff you have on your cupboard and pantry shelves. Packaged side dishes, baking mixes, pastas, condiments, canned goods, chips, cookies and desserts—buckets of desserts—fill the aisles of the food sections of Big Lots and Dollar Tree stores. I should also note that these places stock all kinds of products besides food. I’ve seen Cuisinart food processors at Big Lots, for example, with ridiculously low price tags. If you’ve ever shopped at Costco, you probably have gone in with a shopping list of items to buy and walked out with four times what you’d planned on. Me too. At Big Lots-type stores, I never go with a shopping list because, as I mentioned, the inventory is unpredictable. And again, that’s half the fun—the discovery of the unexpected. So, I don’t do my primary grocery shopping at these stores. Instead, I go in just to browse, usually without anything specific in mind, and wind up surprising myself at how many interesting food items I wind up buying. Although chance encounters rule the day, there are some products you can usually count on finding in these stores. Big Lots, for example, always seems to have Wasa flatbread from Sweden, $2 per 9.7-ounce package. And you’ll usually find Progresso brand canned soups there for about $1 each, not to mention Bear Creek Country Kitchens soup mixes for $3 per package. Baking mixes from Krusteaz are also usually in stock at Big Lots. The Dollar Tree seems to always have one of my favorite snacks, Muncheros Mexican-style flavored peanuts (chili or chili-lime flavored), along with T.G.I. Friday’s flavored potato-skin snacks (I like the jalapeño-cheddar), all just $1 apiece. And one of the best Dollar Tree bangs-for-your-literal-buck is $1 Kendale Farm chicken broth (32 ounces). Mexican pantry staples at Dollar Tree include such good buys such as 29-ounce cans of white hominy, El Pato Mexican hot-style tomato sauce (27 ounces), La Torre traditional refried beans (16 ounces), La Rosa dry pinto or kidney beans (12 ounces), La Costeña pickled jalapeños (12 ounces), canned whole pinto beans (19.75 ounces) and Gebhardt refried beans, all for a mere $1 each. I’m always thrilled when I find canned tamales at my Big Lots store. There are six tamales inside, wrapped in waxy paper, and they make a decadent, if somewhat shameful, midnight snack with a cold beer alongside. OK, so far this might seem like pretty standard stuff, right? But the biggest pleasure I get from liquidation stores is happening upon something unexpected. Tunisian Harissa du Cap Bon, for example. One buck for a bottle of harissa? That’s hard to beat. Or, the aforementioned tins of kippers for $1. And then, there are jars and cans of all sorts of good stuff to make antipasti with. I found a 19-ounce jar of white beans from Spain for $1.50, a 12-ounce bottle of pepperoncini ($1), a 14.5-ounce jar of sweet red peppers ($1) and a 7-ounce box of Meliora crostini ($2), for example. You could put those out with some prosciutto or salami and cheese, and drizzle with Italian Mediterranean Market all-natural extra-virgin olive oil (1 quart for $5). For a taste of Cajun-Creole cooking, there’s Tony Chachere’s Creole seasoning (6 ounces for $1), red beans & rice mix or dirty rice mix ($1 each), Louisiana Hot Sauce (10 ounces for $1), Kajun Fire habanero hot sauce (17 ounces for $1), Larry the Cable Guy fish batter ($1) and Cape May chopped clams for $1 per can. Kohinoor “heat & eat” mughlai-style korma rice was $1.75, and Dari Moroccan couscous was $2. I found Hengstenberg Bavarian-style sauerkraut ($2), tomato-basil hummus chips ($2), dry-roasted edamame snacks ($1.20), banana-walnut granola (12 ounces for $2) and canned coconut milk (14 ounces for $1). I could go on and on. 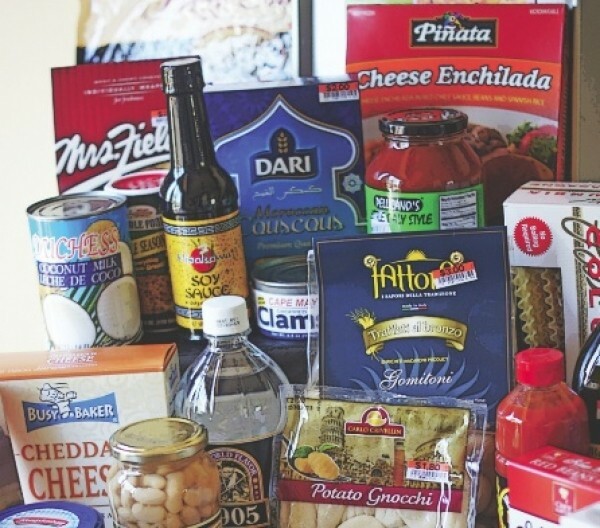 For this column, I gave myself a budget of $60 total to spend at Big Lots and Dollar Tree, and came home with a huge haul; the aforementioned array of foods barely even scratches the surface of all the inexpensive goodies I got. I urge you to try it yourself. You just never know what exotic eats you might find for your hard-earned dollar.